Color(s): Varying shades of black, white and gray. Before purchasing a Wolf Hybrid it is extremely important to check State and Local laws. The Wolf Hybrid is typically referred to as "WolfDog". They are a cross of an Arctic Wolf with a large dog breed. The Wolf Hybrid is generally well-proportioned and very large. They possess long limbs, are agile, and muscular. The face has the appearance of a Wolf with a long, tapering muzzle. The Wolf Hybrid is not recommended for inexperienced or timid owners. They are loyal, devoted, and family oriented. As a "pack" animal they do well with large sized dogs they have been raised with. They are not recommended for homes with small dogs, cats or other household pets. Wolf Hybrid's are suspicious of strangers and will protect their family, property, and territory. The Wolf Hybrid is not recommended for homes with children. Regular brushing is recommended of the Wolf Hybrid. Dry-shampooing will suffice. They may be prone to hip dysplasia. The coat of the Wolf Hybrid is dependent upon the breed of dog breed used. However, the Wolf has a double coat that is extremely dense. Early, intense, and ongoing socialization and obedience is crucial. The Wolf Hybrid will not respond to harsh or heavy-handed methods. Training must be done with respect, firmness, fairness, and consistency. The Wolf Hybrid possesses high endurance and great energy. They are not recommended for apartment or city living. 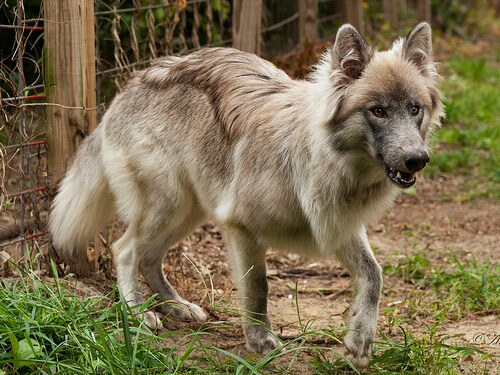 Wolf Hybrid's do best in a securely fenced rural setting with ample room to roam and run.